During the 50s and 60s, the secular worldview was that things functioned from a naturalistic and materialistic base. The belief that “God is dead” produced a hope in science and technology to bring utopia to the Earth. The 70s, however, introduced a paradigm shift in thinking. The “fruits” of technology had the potential for completely eradicating mankind. At this period in time, mankind developed the technology to destroy the entire Earth with weapons of mass destruction. The 80s witnessed an acute awareness that a radical solution needed to be implemented; this solution was not to be limited geographically, but would affect the entire “global community.” Crises such as global warming and ozone depletion were impacting the community. The only remedy is proclaimed to be the implementation of global solutions for the entire planet. In the past two decades, the cry has been for a spiritual solution to global issues. 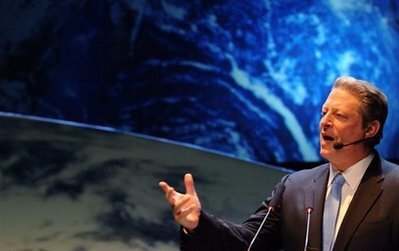 Former Vice President Al Gore has been outspoken in his belief that the only solution to ecological problems is “a spiritual response” common to all religions. Evolution is believed to be the foundation for an ecumenical faith that will unite science and religion toward the salvation of the Earth from ecological disaster; the worship of “Mother Earth” as the goddess Gaia is the next step. Once humanity understands our relationship to Gaia, self-reflexive consciousness toward the Earth becomes the priority. Some of the global warming advocates have even defined the production of carbon dioxide as “sin,” which means all humanity is guilty of a holocaust-like assault upon planet Earth. Of course, it is impossible to repent of this sin because one cannot live without putting more carbon dioxide into the atmosphere. The next stage in this godless belief system is to extend man’s consciousness in such a manner as to unite man and nature, at the expense of self-consciousness (this idolization of nature is quite common of the occult). For instance, shamans believe that the spirit world is in direct connection with the Earth itself. Shamans affirm belief in humanity’s “deeply spiritual relationship with Nature.” Once humanity returns to nature worship, then the Earth will be saved; it is this pagan ideology that is integral to the global warming theory. The output of the model is determined by factors based upon the person creating the model, by their decision to state what to make important and which arbitrarily fixed things will be made constant. The models cannot be regarded as equal to real climate, and therefore, they do not have any predictive power in the real world. What can be known with certainty? “The models show surface warming from adding carbon dioxide to the atmosphere because of their programming. They could yield surface cooling with different programming, without violating any physical law. All that is required is to allow things to change in the model that do, in fact, change in the atmosphere.”  Due to lack of knowledge (“nescience”), we cannot believe in global warming. However, advocates of the theory demand our response in the absence of knowledge, which is the definition of blind faith (and as always, doing things blindly is dangerous, if not deadly). It is prudent to consider how pagan superstition, which is inherent to “global warming” theories, relates to special revelation (Scripture). God has revealed information with regard to Himself and the reality of a spiritual world beyond our own. We do not know these things based upon observation; rather, we know and believe these things based upon the fact that God has spoken. If God did not reveal the truth regarding His existence and nature, and other spiritual and eternal matters, we would not be any different from the pagans who use their imaginations to determine reality. Demanding a response based upon lack of knowledge is a crucial matter for us to consider as Christians. For example, if someone asked the names and orders of all the angels in heaven, we would have to confess we only know the names “Gabriel” and “Michael,” and that Michael is called the archangel. We could not answer any further than what God has revealed. The global warming advocates who demand action based upon lack of knowledge should not motivate us. At best, they are “chicken littles” and at worst, they are spiritual deceivers (false prophets). These advocates would have us believe certain things regarding the world that God has created, yet their assertions cannot be known. To demand action based upon lack of knowledge with regard to creation (the general revelation) is unwarranted and should not motivate us. It is impossible to be held accountable for something that cannot be known. “For the wrath of God is revealed from heaven against all ungodliness and unrighteousness of men who suppress the truth in unrighteousness, because that which is known about God is evident within them; for God made it evident to them. For since the creation of the world His invisible attributes, His eternal power and divine nature, have been clearly seen, being understood through what has been made, so that they are without excuse” (Rom 1:18-20). God holds all humanity accountable because the knowledge of His existence is evident. Conversely, one cannot be held accountable for lack of knowledge, or what cannot be known. The global warming advocates who claim to know what they cannot know, and demand obedience to their so-called knowledge, are deceived and deceiving with regard to the natural revelation. We should not listen to them, any more than we would obey the claims of a cult leader, such as Joseph Smith, the founder of Mormonism. “Let all the earth fear the LORD; let all the inhabitants of the world stand in awe of him” (Ps 33:8). The environmental movement seeks to unite all religions to save the planet, which means the world’s religions must ignore doctrinal differences and unite as one to inaugurate a new spirituality. Christians can be concerned for the environment, but must not let ecology take precedence to fulfilling the Great Commission. The concerns of the environmental movement should be an opportunity to explain the cause and only solution, who is Jesus Christ. Of course, anyone that disagrees with ecologists is thought of as a hindrance to the evolution of mankind. The momentum is for mankind to embrace a goddess religion, which was “eliminated by Christianity,” because such an understanding of Mother Goddess “offers us new insights into the nature of the human experience.” The ethical and moral issues promoted by ecology, constitute an anti-Christian agenda that seeks to eliminate knowledge of God while polluting the souls of the collective. The church needs to guard the revelation of God, which has been given authoritatively, and reject falsely named knowledge (1 Tim 6:20). The Psalmist stated that the winds do not blow by chance, and lightning does not flash by an accidental impulse. God, in the exercise of his sovereign power, rules and controls all the disturbances of the atmosphere. The creation is not infused with the necessary inherent energy to sustain itself, absent from divine providence; rather, it is God’s sustaining activity that governs the world. It is contrary to Scripture to represent God as a momentary Creator, who completed His work once for all, and then left it. Considering this point especially, the church must dissent from the profane, and maintain that the presence of God’s power is evident, not less in the perpetual condition of the world than in its first creation. Even though God commanded humanity in the pre-Fall period to maintain the quality of the creation, it is God who ultimately controls and cares for it, both directly and indirectly. God created the world, and even now He preserves it; the earth and all other things endure just in as far as they are sustained by God’s power. God sustains our Earth; humanity is not powerful otherwise. We are to be good stewards of God’s creation. Global warming, however, lacks conclusive scientific data and is capitalizing upon people’s fears with unsubstantiated and exaggerated information. As biblical Christians, we must have the spiritual and intellectual courage to learn from the Word of God with regard to the great implications for whatever our situation demands. Nature is not better without humanity, contrary to global warming extremists. Man is the steward of nature under God. The only basis for science (as the early scientists knew) is the set of conditions provided in the Word of God (viz. a nature ruled by rational purpose, a mind designed to interpret nature - under the authority of special revelation - as almost all early scientists believed). “I set my rainbow in the cloud, and it shall be for a token of a covenant between me and the earth” (Gen 9:13). Christians should certainly be concerned with regard to the environment. Creation is the handiwork of God. However, God is separate and distinct from His creation. He created all things, but God is not all things. It is because God created all things that Christians are responsible to care for the environment. The worship of nature is, of course, pagan idolatry (Rom 1:18-32). The solution to the problem is not an eco-agenda; rather, the answer is entering into a relationship with Jesus Christ as God and Savior. Man must not fall into the folly of worshiping the creation rather than the Creator. Furthermore, the Christian mandate is not to save the earth, but to be active in proclaiming the Gospel so that souls may be saved, and making disciples of those who have been saved. Christ said that He was “not of this world” (John 8:23). Indeed, this world is “reserved unto fire against the day of judgment” (2 Pet 3:7). The folly of adopting an earth-based salvation is to commit spiritual suicide. Christians need to be active as good stewards of God’s creation, but more so in explaining to a world that is perishing that the solution to man’s dilemma is to be found in Jesus Christ. Christopher Essex and Ross McKitrick, Taken by Storm: The Troubled Science, Policy, and Politics of Global Warming (Toronto: Key Porter Books, 2007) 246.